Rim Size This is a required option. Graphic Size This is a required option. To confrim the right size decal, please measure your rim arc length from the spoke hole to the rim edge. Decal Color This is a required option. One set of stickers covers 1 rim (2 per side). If you have a wheelset, the order quantity should be 2. 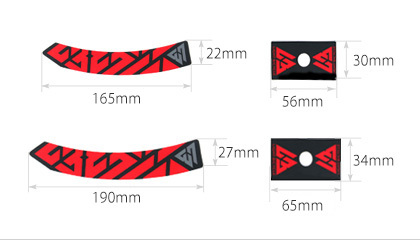 The new Light Bicycle mountain bike carbon wheel rim stickers are made of high quality vinyl, are available in seven colors, and are easily replaceable. Durable and easy to apply or replace as necessary. Please clean area where the sticker is being applied with isopropyl alcohol or similar. Make sure the rim is completely dry before applying the stickers. A small amount of heat from a hair dryer or heat gun can be used to help adhere the sticker to the rim if you are in a cold area. Do not overheat the sticker. Can you make white decals for my AM724 rims? Hi hi. I have 3 sets of LB rims and love them! Would like to order 1 set of these decals - how much is freight to Singapore via the cheapest method? Thank you. Hi, I have a road bike with 700c wheels. 50mm (includes carbon fairing). I need some cool red stickers for the rims to complement my Black and Red colour scheme. Do you post to Australia? and what do you have besides this model? Do you sell stickers for any of your road bike wheels? I'm particularly interested in some for the hand-built 45mm rim.